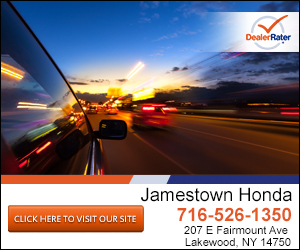 Welcome to the new Jamestown Honda located in Lakewood, NY. We are the newest and largest Honda dealership within 45 miles of Lakewood, NY; also serving the surrounding communities of Fredonia, NY; Van Buren Bay Areas of NY; Warren, PA; and Erie, PA. Our state of the art, brand new 25,000 square foot facility offers the largest selection of the most popular new Honda models such as the CR-V, Accord, Civic, Odyssey, HR-V, Pilot, Fit and the Ridgeline. Our expansive on-site inventory also includes used vehicles and Honda Certified Pre-Owned. All Honda Certified Pre-Owned Vehicles are nearly new and fully certified. Certified Pre-Owned Vehicles come standard with a 182-point inspection, vehicle warranty and benefits program. We have vehicles for all budgets and interests. Customer service is our priority at Jamestown Honda. We make the car buying process simple. Simply select your new or used vehicle, make us an offer and pocket your savings. We offer price transparency in a no hassle environment. It’s simple. No games. No hassle. Our factory trained and certified service technicians are here to help extend the life of your vehicle, with the latest diagnostic and maintenance equipment. We also carry Genuine Honda Parts and Accessories. We make it easy for our customers to schedule a service appointment online or order parts and accessories. You will find all the comforts of home in our new customer lounge with free refreshments and Wi-Fi for your convenience. We look forward to servicing the communities of Lakewood, NY; Fredonia, NY; Van Buren Bay Areas of NY; Warren, PA; and Erie, PA. We encourage you to visit the new Jamestown Honda located at 207 E Fairmont Ave, Lakewood, NY for all of your automotive needs. "Smooth transaction! Nate was excellent!" We appreciate hearing this! Thank you for taking the time to tell us about your experience here at Jamestown Honda! We are grateful for your business and look forward to being your dealership of choice again in the future! "Bill is a man of his word"
Thank you for this great review! We are happy to hear your experience with Bill and Jamestown Honda has been a great one! We appreciate your business and look forward to continuing to work with you! Thank you for this review! We're happy to hear your experience here at Jamestown Honda was 5-star worthy! We appreciate your business! Nate made a bad first impression from another rep who treated us like dirt, turn into a very good experience .ratings are high because of Nate and Paul. Thank you for the review. While we're disappointed to hear you had a frustrating first experience, we are happy to hear Nate was able to turn it around and provide you with good customer service. We appreciate your patience. Curtis Strong is a reliable, honest, straight to the point salesman. He will take the time to tell you about the features of each car and find a vehicle within your price point. I was nervous to deal with a car salesman and afraid that I would be ripped off, but Curtis found me the perfect vehicle for a great price. I would suggest him and the dealership to anyone looking for a great car shopping experience! Thank you Curtis! Thank you for this review! We're happy to hear the Curtis was able to provide you with 5-star customer service! We appreciate your willingness to recommend him & Jamestown Honda to others, based on your experience! Thank you for your business! Nate was informative, easy to deal with and too the point. Best experience yet getting into my 4th lease. Look forward in doing business in the future. Thank you for this review! We're happy to hear that Nate was able to provide you with 5-star service! We appreciate your business & look forward to keeping you as a lifelong customer! I was so impressed with this dealership. We were looking in the parking lot and a woman came out and handed us her card and said if you have any questions you can shoot me a text. I loved that they were not in my face trying to push a sale. Once we started talking with Nichole Kavanaugh we were even more impressed. Everyone there made us feel right at home and overall this was fantastic. I will never go to another dealer. Thank you for this excellent review, Sherry! We appreciate your kind words about Jamestown Honda! We're so happy to hear your experience with us was 5-star worthy. Welcome to the Jamestown Honda family!! "Great car buying experience! " Everyone at this dealership went out of their way to make this the easiest new car purchase we have ever made. We were given a great price on a new Pilot.....no reason to look at any other Honda dealers. 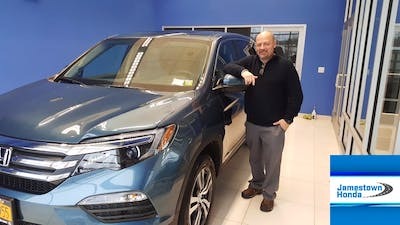 The friendliness of the staff (Dom, Nicole, Tyler, and Bill) and their knowledge about their vehicles made Jamestown Honda a very easy choice for us to make a new car purchase....thank you Jamestown Honda! Thank you so much for this amazing review! We appreciate your kind words about our staff and are so happy to hear that your experience with us was easy and friendly! Congrats on your Pilot and welcome to the Jamestown Honda family! This is my third Honda vehicle. I’m so pleased with the professionalism and helpfulness of the staff at Jamestown Honda. No pressure, just respect. Dominic and Bill went over and above. Thanks, I love my new CRV! Thank you for the 5-star review! We're happy to hear your experience with us was professional and helpful! Thank you for your kind words about our staff! Welcome to the Jamestown Honda family! My wife had a Honda CRV that she ordered new when Hartley had the Honda franchise. She loved it and drove it for many trouble-free years. Since then, the nearest dealer was in Erie, and we wanted to buy locally. So it was a no-brainer for me to go to Jamestown Honda when it opened here. Our salesman is extremely knowledgeable, patient, and attentive to our needs. Everyone on the staff, Bill (GSM), Justin (Finance) and, of course, Curtis, our salesman, are consummate professionals. I love my new Honda CRV EXL - it is a beautiful, comfortable, well-engineered and high tech vehicle that will last me for many years. I am extremely happy with my purchase and I highly recommend Jamestown Honda to anyone in the market for a new SUV. Thank you for this wonderful review, John! We appreciate your business and hope to be able to assist you with all your future Honda needs! 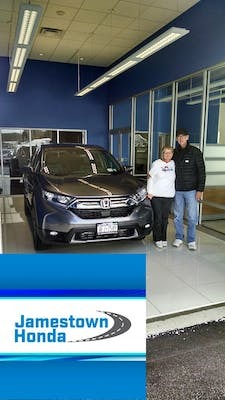 We're glad to hear you're happy with your new CR-V! 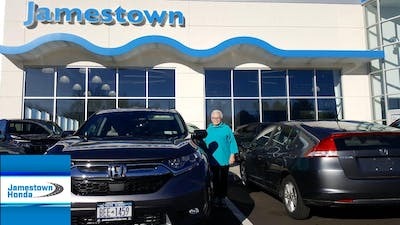 Welcome to the Jamestown Honda family!